Can I See Your I.D.? True crime, desperation, fraud, and adventure: From the impoverished young woman who enchanted nineteenth-century British society as a faux Asian princess, to the sixteen-year-old boy who "stole" a subway train in 1993, to the lonely but clever Frank Abagnale of Catch Me if You Can fame, these ten vignettes offer riveting insight into these and other mind-blowing masquerades! Over the course of history men and women have lived and died. In fact, getting sick and dying can be a big, ugly mess-especially before the modern medical care that we all enjoy today. How They Croaked relays all the gory details of how nineteen world figures gave up the ghost. Readers will be fascinated well past the final curtain, and feel lucky to live in a world with painkillers, X-rays, soap, and 911. Bees don't just produce honey. Your food supply depends on them. Apiarist Dave Hackenberg's bees have a busy travel schedule, pollinating around the United States from February to July. 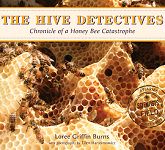 So when Dave inspected four hundred of his hives and found that the bees had simply vanished, a dream team of bee scientists got to work. Though the sun, moon, and planets moved across the sky, the stars themselves appeared immovable, forever fixed in constellations. Only when astronomers began taking a closer look did anyone realize what a fascinating, ever-changing universe lies beyond our solar system—red giant and white dwarf stars, spiral galaxies, wispy nebulae, black holes, and much more! From an early age, actor Jonathan Chesner knew he had the kind of brain that would wear a Hawaiian shirt, bright red pants, and cool painted shoes to a wedding while most other people's brains would wear three-piece suits. He also knew that if he learned how to manage the difficulties of ADHD and harness its awesome powers, he would help other "special brains" by sharing this knowledge in a book to slay all other books. This is that book. ADHD in HD: Brains Gone Wild is a kinetic collection of frank personal stories of failure and success, hilarious anecdotes, wild ideas, and point-blank advice that will resonate with teens and young adults. Is hydro-fracking really safe? Is climate change real? Did the moon landing really happen? How about evolution: fact or fiction? Author-illustrator Darryl Cunningham looks at these and other hot-button science topics and presents a fact-based, visual assessment of current thinking and research on eight different issues everybody's arguing about. His lively storytelling approach incorporates comics, photographs, and diagrams to create substantive but easily accessible reportage. Cunningham's distinctive illustrative style shows how information is manipulated by all sides; his easy-to-follow narratives allow readers to draw their own conclusions. In 1971, Jack Gantos was looking for adventure, cash for college, and a way out of a dead-end job. For 10,000 dollars, he agreed to sail a boat loaded with hashish from the Virgin Islands to NYC. But federal agents were waiting. He was caught and sentenced to 6 years in prison. This is the story of how he turned his life around and became a writer. William dreamed of building a windmill that would bring electricity and running water to his village. With a small pile of science books, some scrap metal and tractor parts, and curiosity and determination, he embarked on a daring plan to forge a small miracle that would change the lives around him. Susan Kuklin met and interviewed six transgender or gender-neutral young adults and used her skills to represent them before, during, and after their personal acknowledgment of gender preference. Portraits, family photographs, and candid images grace the pages, augmenting the journey taken. Each honest discussion and disclosure, whether joyful or heartbreaking, is completely different from the other because of family dynamics, living situations, gender, and the transition these teens make in recognition of their true selves. In Hijas Americanas, Rosie Molinary sheds new light on what it means to grow up Latina. Drawing upon her own experiences, as well as interviews and surveys collected from more than 500 Latina women, Molinary provides a powerful understanding of the inner conflicts and powerful triumphs of Latinas. The women profiled in this book are Caribbean, Mexican, Central American, and South American. These women have all grappled with the experience of coming of age within not one but two cultures — that of the United States, and that of their familial homelands. On a remote island off the coast of New Zealand live the last kakapo parrots on earth. These trusting, flightless, and beautiful birds have suffered devastating loss. Now, the National Kakapo Recovery Team is working to restore their population, with the help of 14 humans who share a single hut and a passion for saving these odd ground-dwelling birds. People have always feared and respected blood. It spills out at both birth and death -- its bright red color like a warning sign -- indicating events of the utmost significance. Scientists only recently began to understand this fascinating fluid. This comprehensive (and sometimes horrific) investigation into blood's past and present will surely enthrall. In this book, Rodriguez shares her experience growing up in the shadow of low expectations, reveals how she was able to fake her own pregnancy, and reveals all that she learned from the experience. But more than that, Gaby's story is about fighting stereotypes, and how one girl found the strength to come out from the shadow of low expectations to forge a bright future for herself. Jeannette Walls tells the story of her childhood -- living like nomads, moving among Southwest desert towns, before retreating to the dismal West Virginia mining town her father, Rex Walls, had done everything he could to escape. He drank. He stole the grocery money and disappeared for days. As the dysfunction of the family escalated, Jeannette and her brother and sisters had to find the will to leave home.